A puzzle that only a musician could solve; a mystery that only a musician could write. 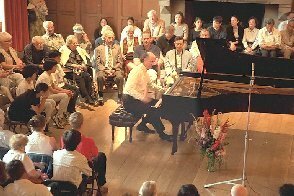 Concert pianist Arthur Singer, age 30 in his 18th year on tour, is in danger of burnout. 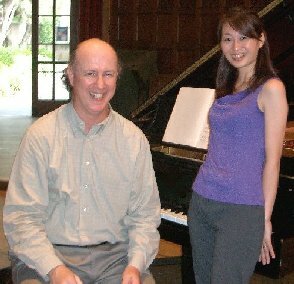 Performing and teaching at Wisconsin University at Black Falls is what he needs, says his manager. But passion and homicide supervene, in this "absolutely original" mystery "teeming with life and its perils and joys," with "characters alive and real, their voices distinct." "A stunning debut novel exploring loneliness, love and professional identity." "This imaginatively programmed and beautifully played recital may be the most realistic recording I know of a piano: truly breathtaking transparency, amazingly truthful dynamics and timbral purity, and an almost spooky replication of space and ambience." 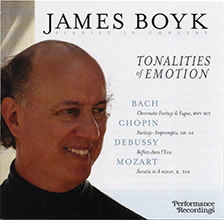 on James Boyk's album "Tonalities of Emotion"
"The images, the ways of learning... Not playing a hundred times the same passage, but thinking about it...."
Margaret Thornhill, clarinetist, Los Angeles Performer, treasured teacher & coach, founder Los Angeles Clarinet Choir & Claremont Clarinet Festival. Sophia Gilmson, pianist, Austin, TX Performer, renowned pedagogue. School of Music, U. of Texas. David Hattner, clarinetist, Portland, OR Conductor and Music Director, Portland Youth Philharmonic. Jennifer Cluff, flutist Performer, teacher, blogger, enthusiast. Music Animation Machine and other treats from Stephen Malinowski. Gerald Jay Sussman, Scientist-Mathematician Panasonic Professor of Electrical Engineering, MIT. David Boyk's site Bollywood for the Skeptical, pix of India & other subjects, music. You're in the Magician's Hands! 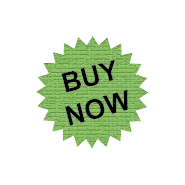 Performance Recordings® store is now open! VIDEO and AUDIO by James Boyk and students. Magician's CONCERTS astonish and delight. "It took me up to Heaven." Concert ALBUMS pulled from hat. "Remarkable feeling for the music's innermost emotions." "Brought tears to my eyes and sent a chill down my spine." Web design by David Boyk. HiFi Magazin (Hungary). Entire Web site copyright © 1997-2010 Performance Recordings®. "You're in the magician's hands" TM SM 2007. All rights to entire site reserved.